Students can earn credit by successfully completing specific exams in lieu of a given course. You may already have the knowledge required for college credit. See if a course you are planning to take is listed below in the approved list of Departmental Exams. Review the Common Course Outline of that course, you will have to demonstrate knowledge in at least 70% of the learning objectives. Initiate meeting to secure Departmental Exam candidate approval signature, email pla@ccbcmd.edu. Score at least a 70% on the exam to obtain the credits. 1Departmental examinations are available for many CRJU courses. 2Departmental exams in Math are generally available for classes that do not have CLEP or other standardized testing options. Contact the Mathematics Department on any of the campuses: Catonsville - 443.840.4903; Dundalk - 443.840.3292; Essex - 443.840.1412. 3Arabic, Chinese, Italian, Japanese or Russian 101, 102, 201, and 202 Departmental Exams are available to students that do NOT meet the Maryland High School Articulation Agreement Requirements. Learn more about Dual Credit. 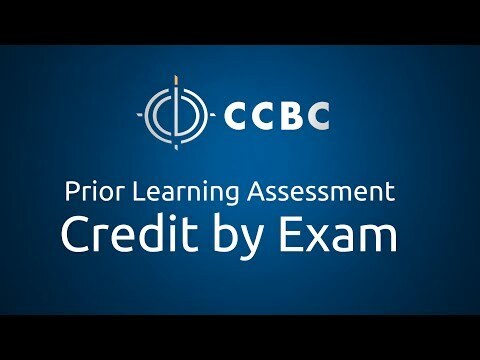 Explains the process of obtaining college credit by prior learning exam at CCBC.